Touring is not like other cycling, so different equipment rules apply. Instead of always leaning towards lightweight, fancy components, it can be advantageous to stick to slightly overbuilt and commonplace parts. Carbon frames with ultralight components are great for a road bike, but how would they handle 2,000 fully loaded miles? Hydraulic brakes are a high-end, frictionless braking alternative on mountain bikes, but how are you going to handle a fluid leak in the middle of the Rockies? Those are extremes, but it’s important to remember that even minor non-standard parts can leave you dead in the water. On a pleasant, summer day, while riding just outside of Lusk, WY, I had the misfortune of snapping a chain. Having repair tools in my pannier, I quickly fixed it and continued my ride. But then it snapped again. And again. And again. By the time I rolled into Casper, WY, I knew there was no way I would be leaving town without a brand new chain. The next morning, I headed to the now defunct Ragged Edge Sports outdoor equipment store in search of drive train repair. After swapping out both my chain and cassette, I hit the road confident that my breakdown woes were behind me. I would quickly learn that this was false confidence, as the first hard, uphill push while on my middle chainring sent my crank zipping forward while my chain stood still. My worn-down middle chainring could no longer properly catch my new, unstretched chain. 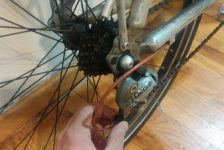 For those new to or unfamiliar with bicycle maintenance, I’ll give a quick explanation of what had happened. Brand new bicycle chains fit very nicely within the teeth of both the chainrings (the large cogs connected to the right-side crank arm) and the cassette rings (the little cogs on the right-side of the rear wheel). As miles are traveled, the chain will pull on the teeth of those different cogs so that instead of being straight up and down, they start to lean towards the front of the bicycle, like a plant towards the sun. This is typically unnoticeable, though, because while the cogs are stretching, so is the chain, becoming suited to those less-vertical cogs teeth. So while the cogs are no longer perfect, the chain matches them in their imperfection, making their union more perfect. Very romantic. Unfortunately, should the chain be replaced, a lovers quarrel may arise between the two new partners. The shiny and new, unstretched chain may not be able to sit comfortably within the sloped teeth of the old cogs, depending on how old the cogs are and how far they lean forward. This is what was happening to me. My unstretched chain could only sit well enough in my middle chainring (my most frequently used chainring) to function properly under low to medium force. Any real pushing (like what is done while traveling uphill or when first getting up to speed), caused the cassette to slip out from under the chain making a loud grinding noise and spinning my legs underneath me, while doing no real damage. Now, I knew that the resolution for this was simple. I had replaced only my cassette with my chain because I had assumed my front chainrings did not need replacement. As I was now proven incorrect in that assumption, I would simply have to replace that middle chainring. Easy enough, and here we come to the whole point of this article (this is why I told you to bring a snack). While the labor required to replace a chainring was minimal, since I was riding an older, non-standard crankset, the act of procuring a new chainring was going to be much more difficult. My crankset was an old Shimano Octalink setup that had been discontinued years prior, and while parts were available, they were no longer standard stock for the average bike shop. If I wanted my chainring replaced, they needed to order the part. I needed to hit the road, so I decided to order the part to a shop I’d be reaching in a week or so, and just stay off that middle chainring as much as possible. It was not a great solution, but it was all that could be done if I didn’t want to wait around in Casper for a few days. That day I learned an important lesson, pickins can be slim while on tour in the middle of nowhere, so it’s better to have run of the mill components than to get fancier gear that can leave you in a bind. If I had a standard 74/110 chainring configuration on my crankset, I could’ve hit the road with a smile on my face instead of a slightly disconcerted grimace. Learn from my mistakes. Make sure your components can be easily repaired or replaced if need be, as the need will inevitably eventually be. Frames Steel all the way. While carbon and aluminum are lighter, steel is less prone to cracking, as it will bend before breaking. On top of that, if carbon or aluminum crack, the frame is shot, whereas steal can be welded. Alternatively, if money is not an issue, Ti is a durable, lightweight option, though any cracks would require frame replacement (usually covered under warranty). Bottom Bracket Square taper is the most common, and therefore the easiest to replace without changing up the rest of your drive train. Any bike shop will have at least one type of square taper BB, which even if it’s the lowest of low end will at the very least give you the mileage to get to a different shop. Also, if you break a crank arm (strip, crack, etc. ), you’re more likely to find a cheap, used square taper arm than a proprietary arm. Cassette/Chain On tour, 9-speeds should be plenty. Additionally, 9-speed chains are cheaper and more prevalent, should you need to replace them. When purchasing a chain, do yourself a favor and buy one with a removable link (Powerlink, for example), which will make installation easier. Spare removable links are also recommended for breaks. Clipless Pedals  Each riding style has a different clipless preference. Road racers lean toward Look and triathletes prefer Speedplay, but the easiest to find at a sporting goods/recreation store is SPD. They are not fancy, but they are cheap and everywhere. Additionally, SPD/platform dual-pedals are available, allowing you to wear regular shoes while riding around town after finishing for the day. Brakes Rim brakes are the easiest to find replacements for, but brake component breakdown is a fairly uncommon problem (cables snap, not calipers). Due to this, I would have to lean towards mechanical disc brakes since they have long pad life, grab hard, can wet without losing much in the way of stopping power, and they won’t heat up your rims on extended descents. Hydraulic are riskier, since repairs can’t typically be handled without adding a significant amount of gear to your kit. Shifters You probably don’t want STI shifters on your bike as they would be more difficult/expensive to replace should they break, but I’ve always had them, so go ask someone else. Tires/Wheels In the US, 700c wheels are a standard and available at all shops. 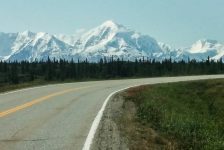 Finding wider tires (32, 35, and beyond) can be difficult depending on where you are, but you’ll at least be able to make due with a narrower tire for a time. If you plan on traveling to other countries, especially in South and Central America, you may want to think about 26 wheels. Not only are 26 more likely to be available, they also take a fatter tire providing more comfort. If you’re sticking with 700c down south, carry spare spokes and tubes and avoid cracking your rim. 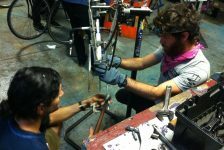 Regardless of how you build/select your touring bike, one of the goals you should have is to not put yourself in a position where a single component failure can end your tour, either by taking too long to fix or by costing too much money. This is one time you don’t want to be unique. Get a tattoo, don’t get a carbon crankset. Everyone has different experiences, though, so if you have any other component recommendations or thoughts, please leave a comment below. I know some stuff, but there’s a lot more stuff that I don’t yet know.